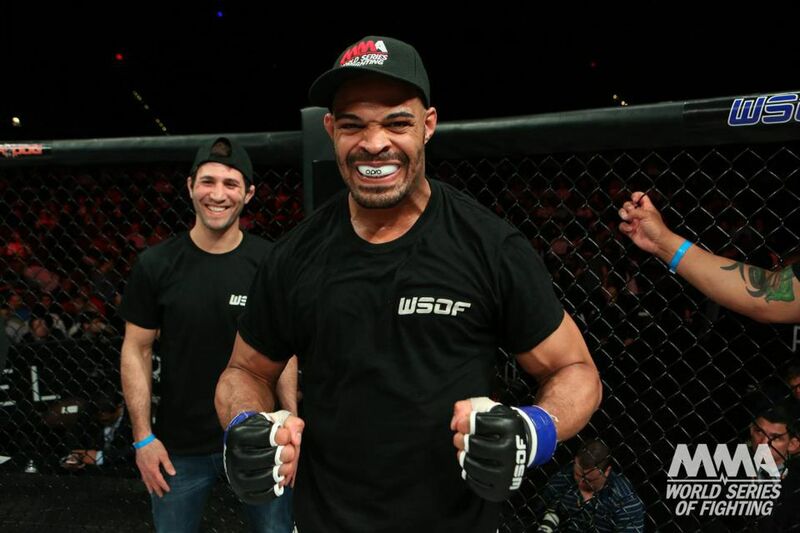 World Series of Fighting made its first trip to Kansas City on Friday night, and David Branch successfully defended one of his belts in the main event. Originally headlined by lightweight champion Justin Gaethje against Ozzy Dugulubgov – canceled hours before the event due to the challenger’s illness –, WSOF 33 featured two-division champion Branch putting his 205-pound title on the line against Vinny Magalhaes, and he dominated the Brazilian for five rounds to remain unbeaten under the WSOF banner. Putting his light heavyweight title on the line for the first time, Branch, who also holds the middleweight crown, came close to stopping Magalhaes in the second round, dropping him to the ground and rocking him standing. The referee didn’t stop the contest, but Magalhaes couldn’t offer any trouble to the champion from that moment on. After five rounds, Branch was declared the winner by unanimous decision. After defending the 205-opund gold for the first time, Branch indicated that his future might be as a middleweight. Following the unanimous decision loss, his first defeat in five fights after leaving the UFC in 2013, Magalhaes was clearly disappointed and talked of retirement. Watch the Full Glory 46: Rico Verhoeven vs. Bigfoot Silva Replay Free, Now!